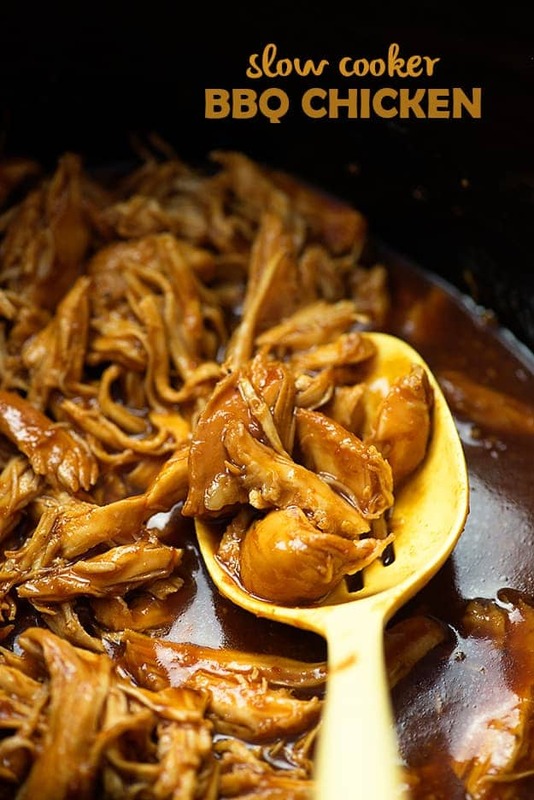 This crockpot BBQ chicken recipe is so easy to toss together. Add everything to your slow cooker and let the magic happen. You’ll come home to juicy BBQ pulled chicken and a house that smells amazing. I’m having a wee bit of a love affair with my slow cooker lately. Nobody tell my Instant Pot, okay? I know the cool new appliance on the block is the pressure cooker, and I like mine. It’s great. 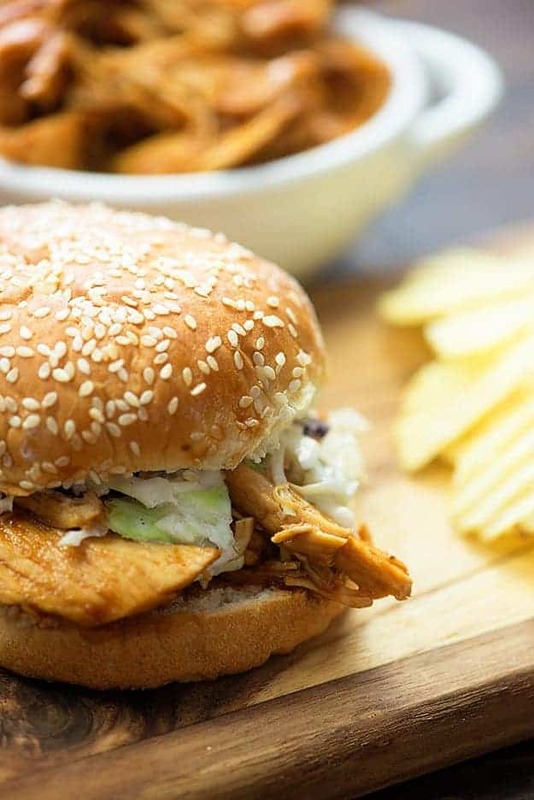 I like to turn this slow cooker BBQ chicken into sandwiches, topped with this easy coleslaw recipe, but it’s also good over rice or with a side of mashed potatoes. 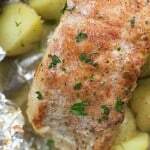 I have a lot of crockpot chicken breast recipes on this site, because it’s my favorite way to eat chicken. I’m honestly not a huge fan of chicken, but I like it just fine when it’s been slow cooked and shredded. 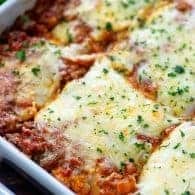 I do crockpot chicken breast with just salt and pepper and shred it up to use it in my chicken enchilada casserole and chicken stuffed peppers. Chicken in the slow cooker is the best, if you ask me! You guys, this is embarassingly easy! You’re going to start with a pack of chicken breasts and then a cup of bottled barbecue sauce. We’re not stopping there though! We’re going to doctor that bbq sauce up into something fabulous! You’ll add some vinegar, brown sugar, and spices to the bottled sauce to really amp up the flavor and make this a little more special. You can start with whatever your favorite bottled sauce is. The extra vinegar and sugar works well with every sauce I’ve tried! I normally use Sweet Baby Ray’s in this recipe. You might be tempted to add some extra liquid to your slow cooker, but please don’t. The chicken will release plenty of juices as it starts to cook and the slow cooker keeps all that steamy goodness right inside, so everything is perfectly moist. No extra liquid required. It’s important to keep in mind that every slow cooker cooks a bit differently – some run hotter and cook faster than others. Slow Cooker: Seems obvious, right? This is the only special tool you’ll need and I’m willing to bet most of you already have a slow cooker in your house. If you don’t, I highly recommend the Ninja slow cooker (affiliate link). I have 5 different slow cookers in my house, but the Ninja is the one I always grab first. It cooks evenly and I really like the shape and size of it. 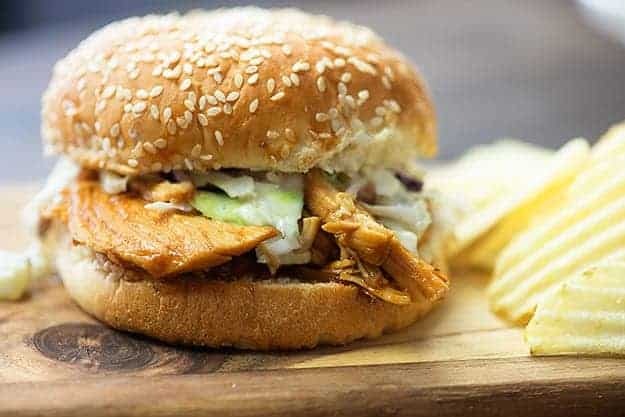 Anything that goes well with pulled pork is going to go great with this slow cooker barbecue chicken! 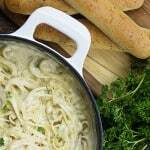 Our favorites are my classic macaroni salad recipe, cheesy ranch potatoes, and Instant Pot mac and cheese. For dessert, this banana pudding seems like a win. 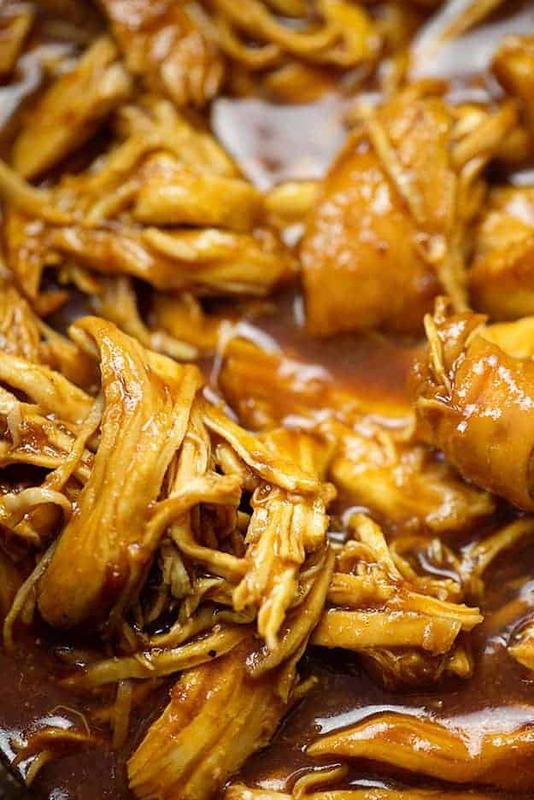 This slow cooker barbecue chicken comes out tender, juicy, sweet, and tangy. The red pepper flakes add a bit of heat, but we don’t find it overwhelming at all. Feel free to reduce the amount of red pepper to suit your tastes. 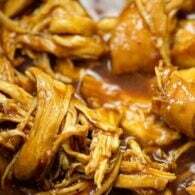 Give this crockpot BBQ chicken recipe a try and let me know what you think! Snap a photo of your dinner and tag me at #bunsinmyoven on Instagram or join my Facebook group and share your photo there! I love seeing when you guys make my recipes! The crockpot BBQ chicken comes out tender, juicy, and full of barbecue flavor. I normally use Sweet Baby Ray's sauce in this recipe, but whatever you have on hand will work. Feel free to reduce the amount of red pepper to suit your own tastes. As is, this has a little kick, but isn't overly spicy. Add the chicken breasts to a slow cooker. 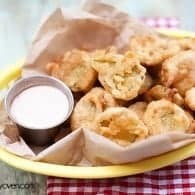 In a small bowl, whisk together the barbecue sauce, brown sugar, vinegar, Worcestershire sauce, red pepper flakes, garlic powder, and onion powder. Pour the barbecue sauce mixture over the chicken and stir to coat. Cover the slow cooker and cook on low for 4 hours or until chicken is easily shred with a fork. 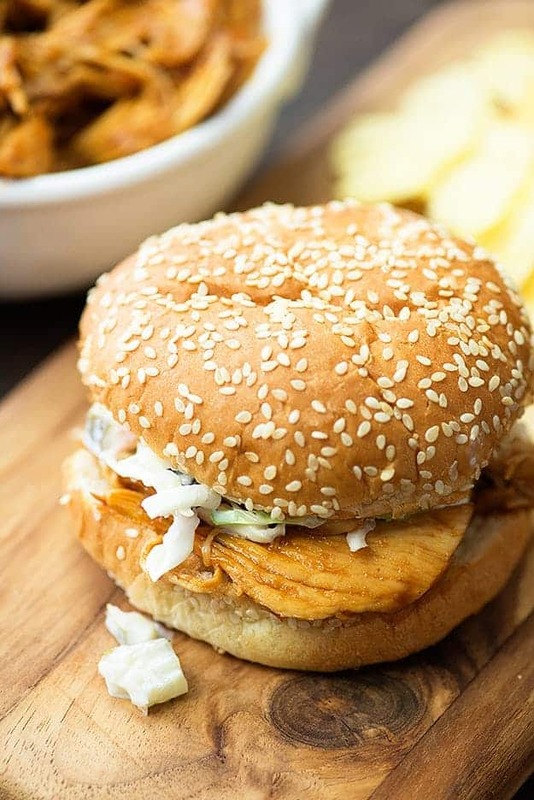 Spoon the chicken onto the sandwich buns and top with coleslaw just before serving. So simple and so tasty! I don’t have a slowcooker, but I don’t mind doing it the old-fashioned way. Great BBQ Chicken! And we’re moving into that season where I start craving BBQ sandwiches. Looks very good and so easy.. Would it be ok to use chicken thighs. or only good with chicken breasts?? thank you for recipe.. The bbq chicken looks so good, I will be making it soon. I had to check out your macaroni salad because it looks a lot like the one I grew up eating. It is almost the same!!! We add some olive juice with the mayo and diced green peppers. 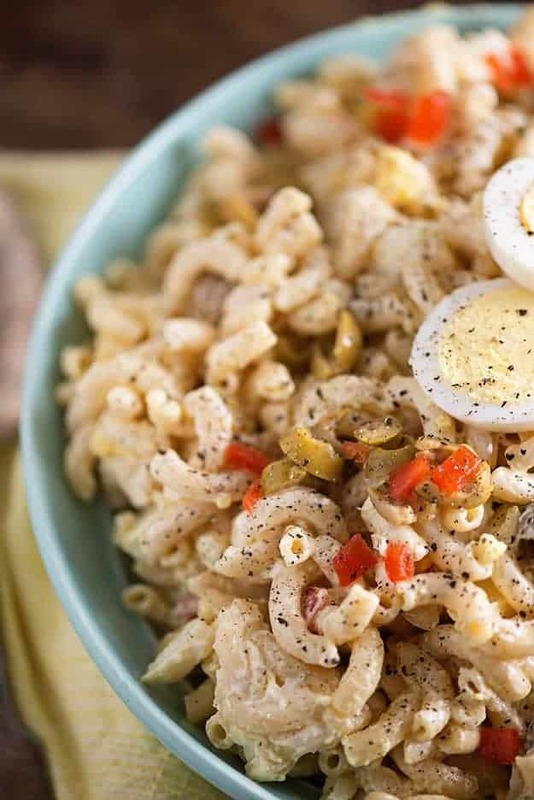 It is so different from others but it is what macaroni salad is to me. I was so happy to see your recipe. Ooh, I bet olive juice makes a great addition to the macaroni salad! 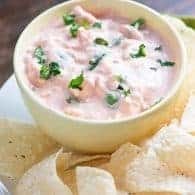 Omg, my family would love this recipe! You basically had me sold at crockpot. I love simple dinners! I love your site! You have great recipes and photos. This BBQ Chicken looks fantastic and the crockpot is for sure a bonus! Yum yum yum yum yum! Drooling looking at this. Sweet Baby Ray’s is my favourite sauce. Thanks for the recipe. ?? We eat pull pork, BBQ everything, and this recipe will be a pleasure to add to our must eat list. Thanks for sharing. Recipe is delicious and the chicken is juicy and tender but the BBQ sauce is a bit thinner than I prefer but other than that I will definitely do this one again. You could add in a bit of cornstarch to thicken it up, if you like. 🙂 Remove the chicken, add the cornstarch, and whisk well. Cook on high heat until thickened. I made this and it was perfect. Other recipes (on other blogs) have made the chicken too stringy and not very tasty. I’ll be making this one again. Thank you, I look forward to trying this. One question, I don’t have onion powder at my home right now. Do you think chopping up an onion and adding it to the crockpot will have a similar effect on the taste? Either way, will let you all know how it turns out. So good! This will be my go-to from now on! At first I thought the sauce was thin too. But I tried it as-is and it was juicy and delicious! I had almost 2 1/2 lbs chicken breasts (just two large ones) so I cooked it more like 8 hours. Perfect! !